View of Cathcart House, Glasgow with Cathcart Castle visible in the background. Glasgow, Old Castle Road, Cathcart Castle. 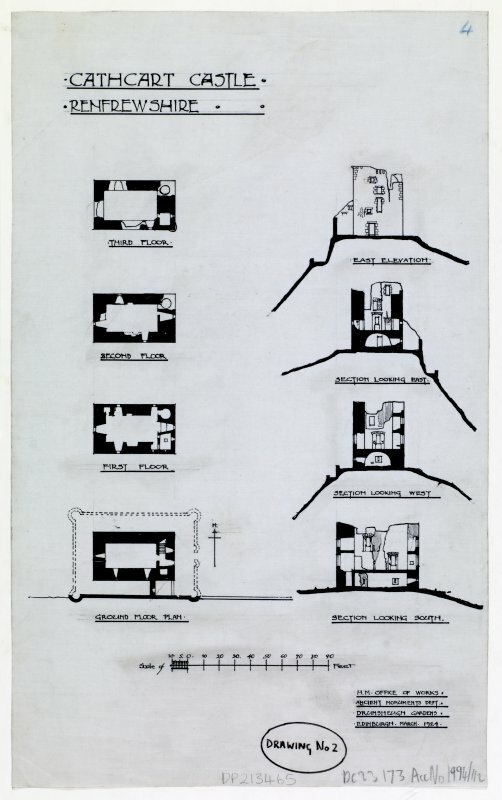 Plans, elevations and section. Glasgow, Old Castle Road, Cathcart Castle. 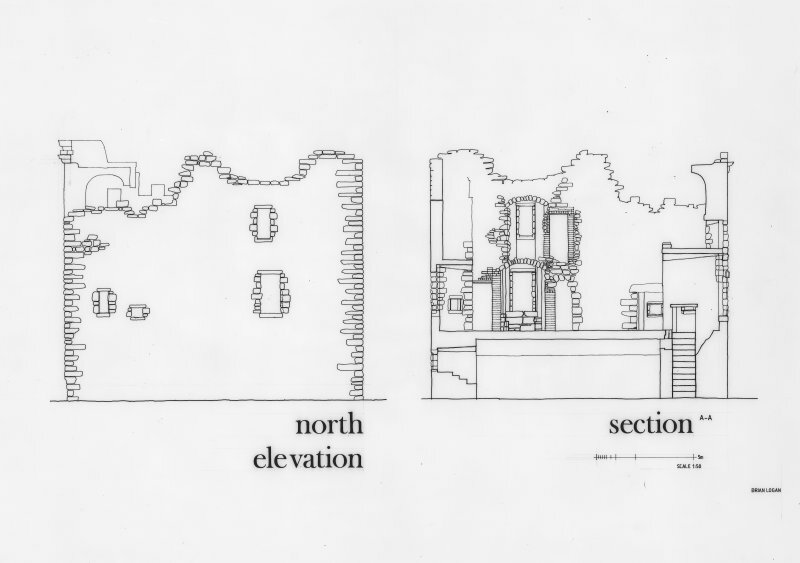 Drawing of East and West elevations. Titled: 'East' 'West elevations'. Cathcart Castle, from south east. Glasgow, Old Castle Road, Cathcart Castle. 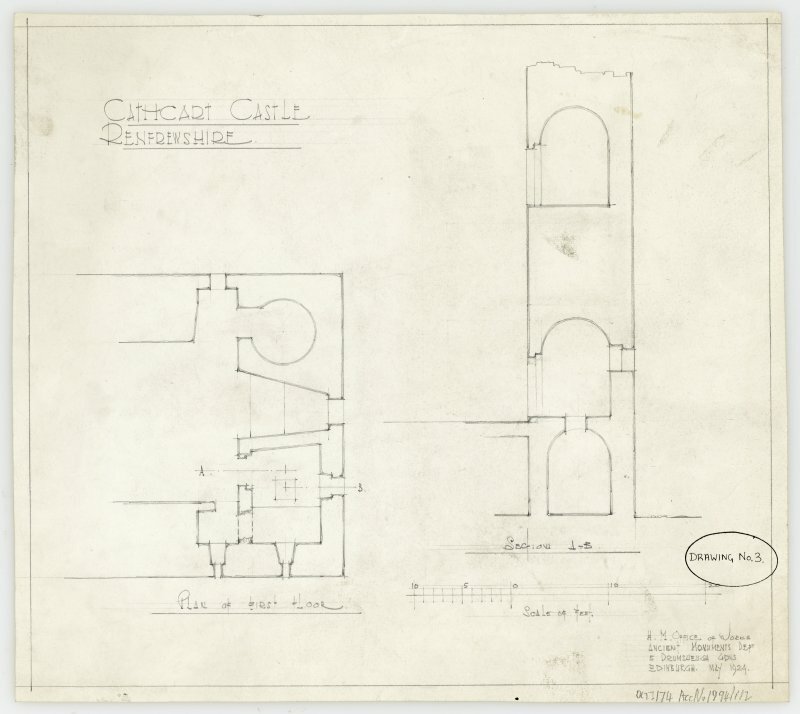 Drawing of floor plans. 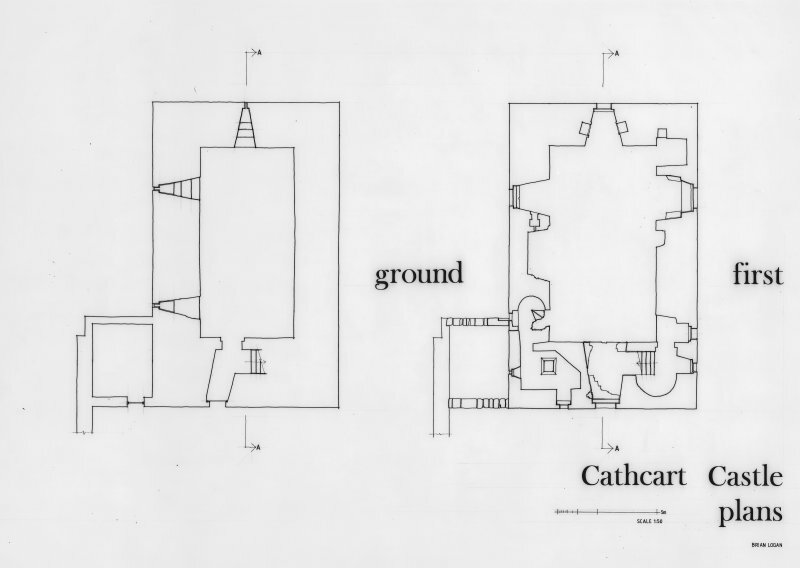 Titled: 'Ground' 'First' 'Cathcart Castle plans'. Glasgow, Old Castle Road, Cathcart Castle. Ground plan. 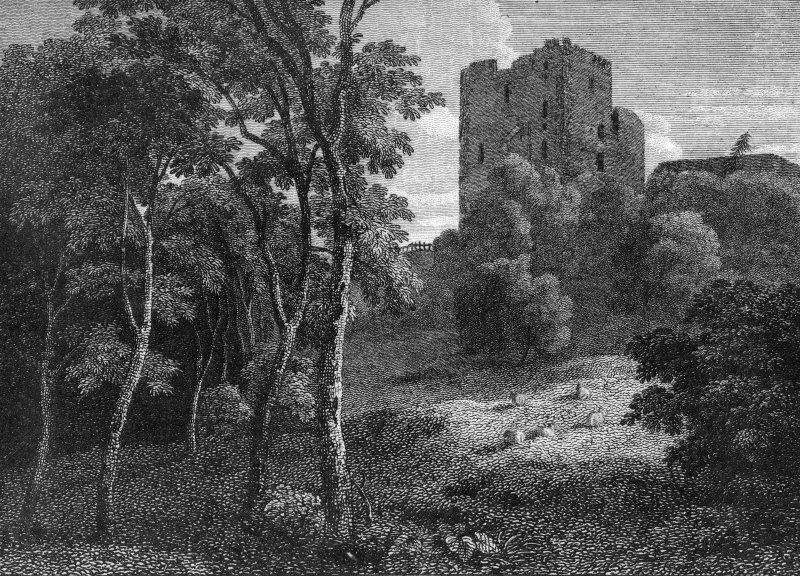 Glasgow, Old Castle Street, Cathcart Castle. General view from East-South-East. Glasgow, Old Castle Street, Cathcart Castle. General view of South facade from West. 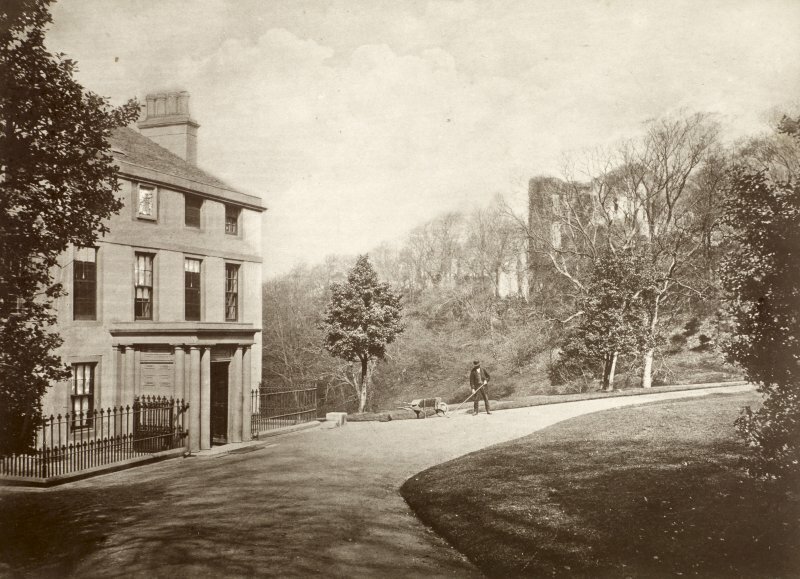 Glasgow, Old Castle Street, Cathcart Castle. View from South-East. Cathcart Castle, from north west. Cathcart Castle, south west side from west. 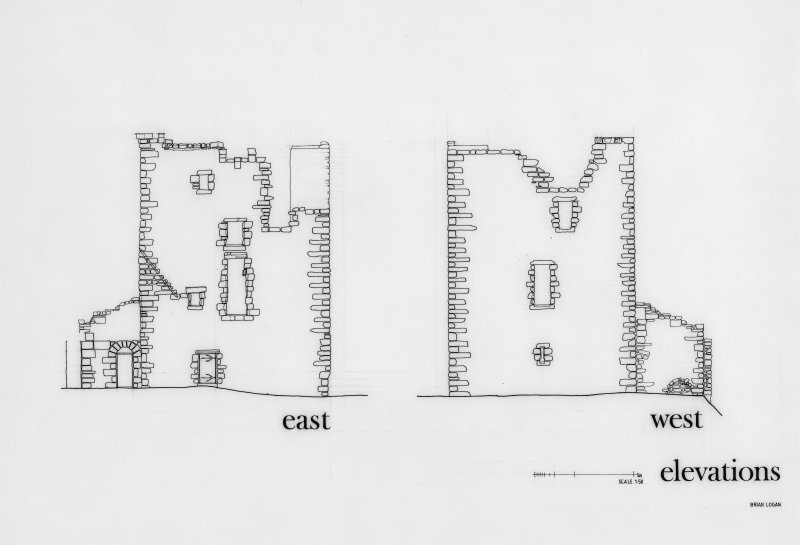 The keep, about 15 by 9 metres (50 by 30 feet), with vaulted ground and upper floors, had an internal turnpike stair for security and was surrounded by a curtain wall. It fell out of use in the mid-16th century and about 1740 was dis-roofed, prior to a proposed demolition. This was not carried out until 1980, long after Glasgow Corporation had bought the estate to form Linn Park. For Linn Park (centred NS 585 593), see NS55NE 261. 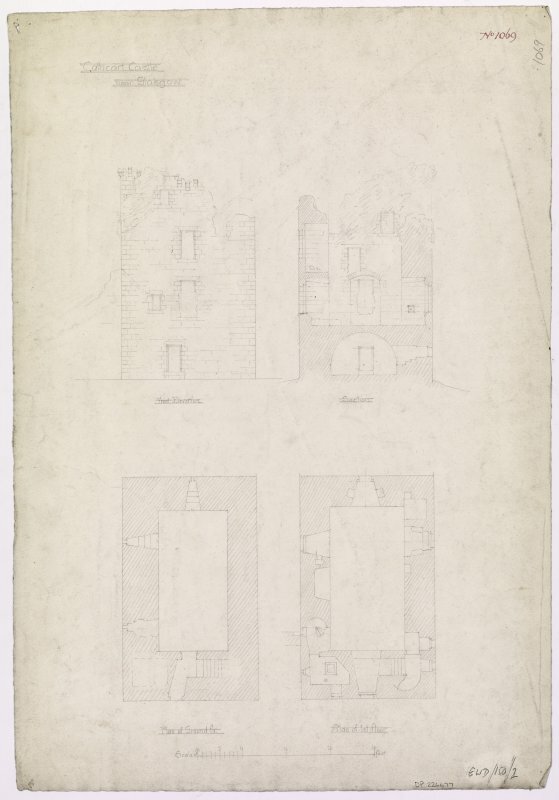 Cathcart Castle consists of a simple oblong keep, 51' x 30 3/4', surrounded at a distance of about 10', by curtain walls, strengthened with round corner towers. The ground floor of the keep is vaulted. 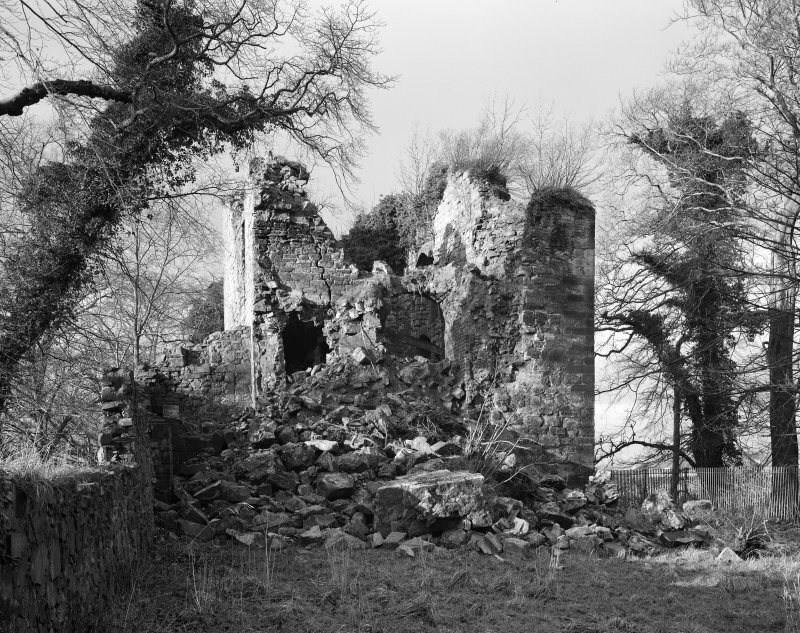 The estate of Cathcart belonged to a family of the same name from the 12th century. From its style, it may be assumed that this castle was erected in the 15th century. It was inhabited till about 1740, when the proprietor moved to a new house, and the roof of the castle was removed. D MacGibbon and T Ross 1887-92; A H Millar 1889. 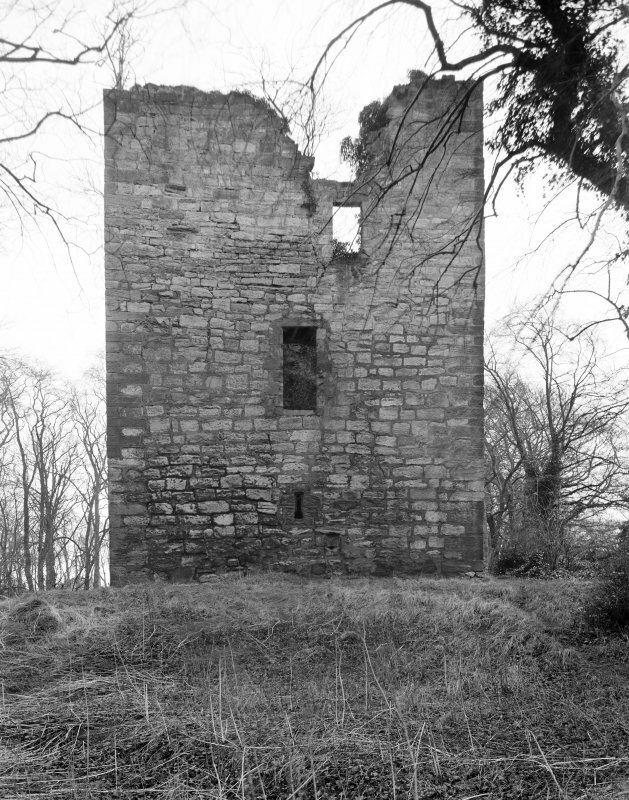 Cathcart Castle: A rectangular keep, the walls of which are now in a poor condition. They have been restored in places. Parts of the curtain wall can be seen, built into the natural rock escarpment on the S side of the keep. Here are the remains of a small tower with a shot-hole. A level area of ground W of the tower appears to have formed a small bailey. The castle, property of the Earl of Cathcart, is closed to the public. Visited by OS (J L D) 1 April 1954. 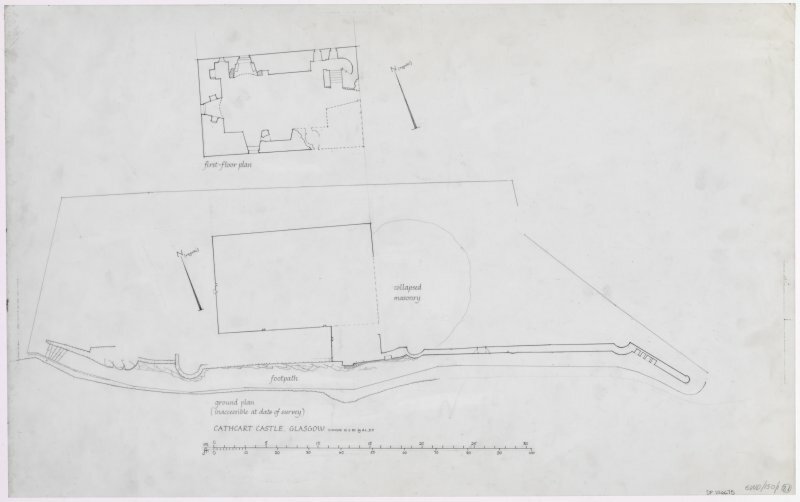 Welsh notes 'outline features on NE and E of monument on Court Hill, and on S of castle grounds immediately W of Old Castle Road, also on W side of Castle, suggesting a ringwork'. Information contained in letter from T C Welsh to OS, 20 September 1974. 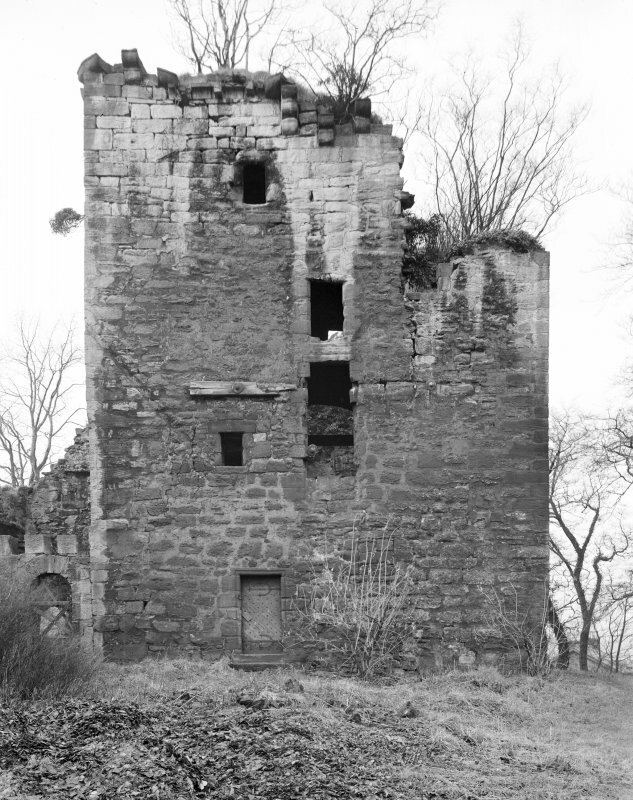 Cathcart Castle has had to be partially demolished as it was in a dangerous condition. The oblong keep has been reduced to a height of 3ft. It is hoped that the remaining walls can be consolidated, and a plaque put up. Source: Glasgow Herald, 2 September, 1980. 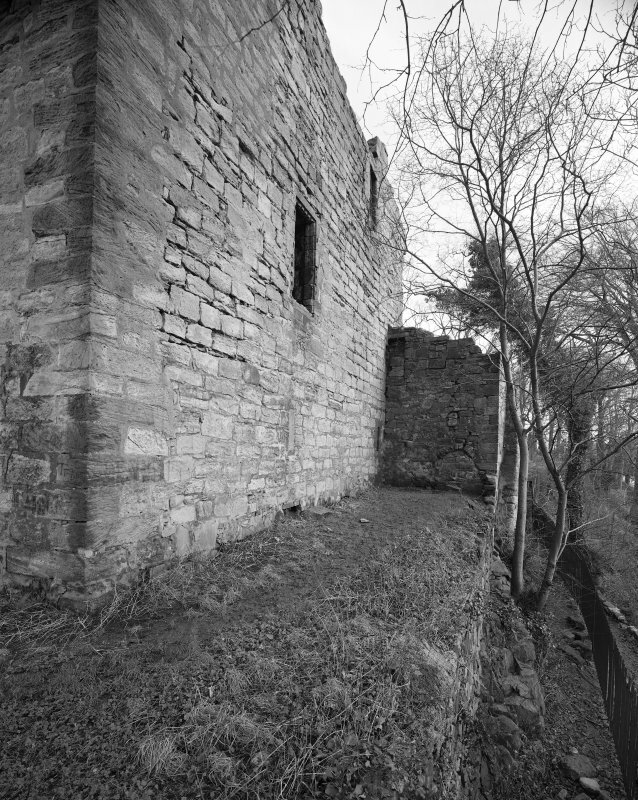 At the N end of Linn Park (off Old Castle Road), lie the meagre remains of Cathcart Castle, atop a cliff overhanging the Cart. Only the lowest courses survive of the 15th century keep built by the Cathcarts. It was abandoned as a dwelling c. 1740, and sold for building materials. In 1866, it still had five storeys, and was surrounded by smaller buildings. It was a simple oblong structure within a barmkin, and had a first-floor hall over a crudely vaulted ground floor. 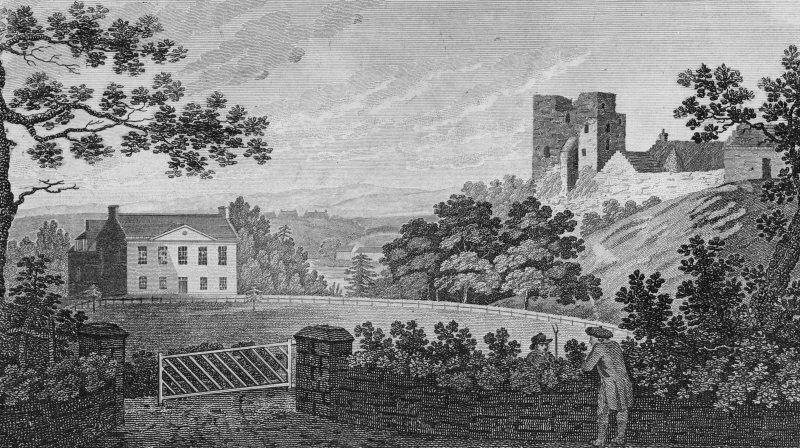 Engraved view of Cathcart Castle and Cartside Villa. Notes: The engraving is a plate from 'An elegant Collection of Interesting views in Scotland', 1802.
p.7 - old buildings in Courtyard of castle, photograph. 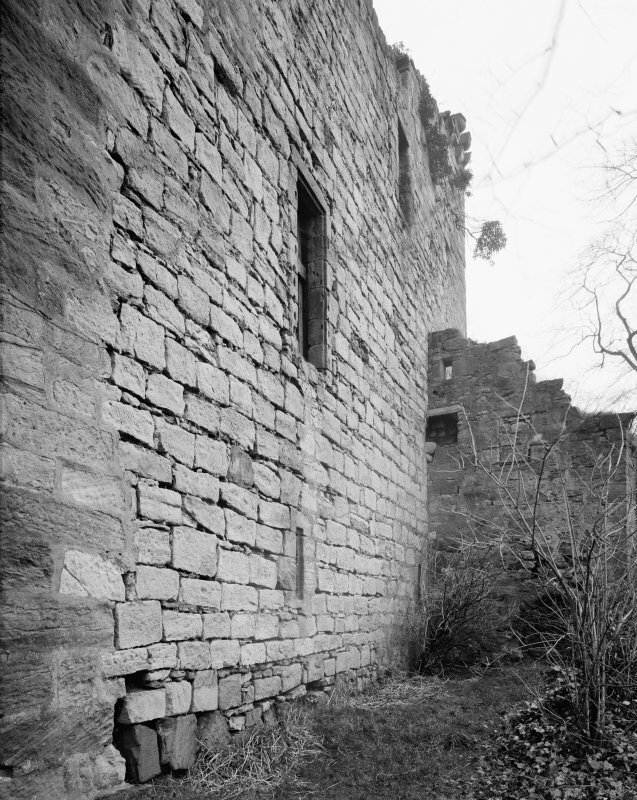 p.13 - castle and courtyard, photograph. p.5 - sundial at castle, photograph. 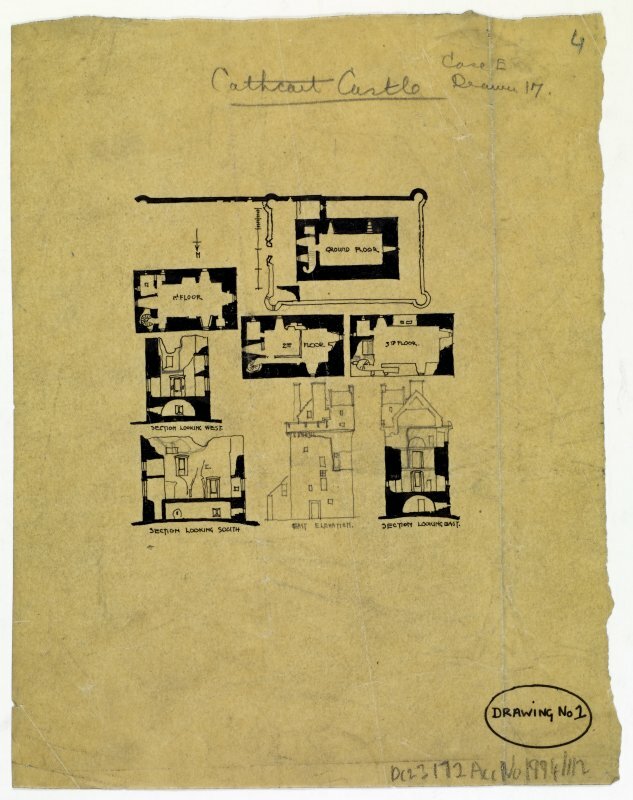 Non-Guardianship Sites Plan Collection,DC23172- DC23174, 1924. 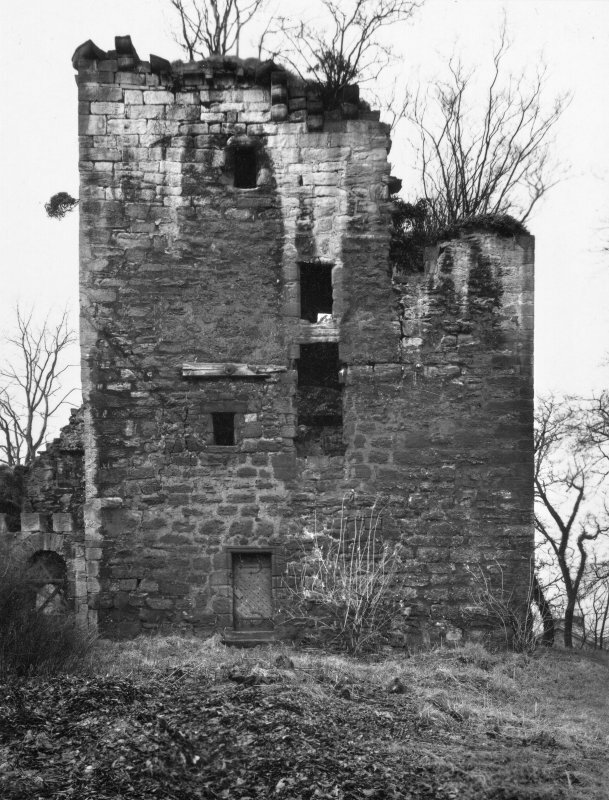 After the demolition of the medieval tower in 1980 (following a partial collapse in 1979) the site was excavated as a Manpower Services Scheme sponsored by Glasgow Urban Archaeology Support Group in 1980-81 prior to landscaping, to investigate the layout of the castle and barmkin.